As Cole Beasley took to Twitter to comment on his usage with the Dallas Cowboys, slot receivers entering this year's NFL Draft were dominating at the Senior Bowl. While everyone knew about players like South Carolina's Deebo Samuel coming into the week, some more under-the-radar slot guys made big names for themselves nationally due to their play. Now, it appears the Cowboys could have their pick of the litter in terms of slot receivers come pick 58, and might find an immediate replacement for Cole Beasley if he prices out of their range. Let's take a look at 3 wide receivers who took Cowboys Nation by storm at last week's Senior Bowl. When you talk about winning a week of practice, you have to talk about Georgia State wide receiver Penny Hart. Despite his small size, Hart embarrassed defensive backs in the slot rep in and rep out at the Senior Bowl. For three straight days of practice, Penny Hart was making highlight plays and going viral within draft Twitter. Previously thought of by many as a late day three prospect, Hart might have played himself into much higher consideration during the 2019 draft. Honestly, Andy Isabella might be a top 50 pick in this draft class. He's good. Really good. Isabella has top-notch quickness, fantastic foot-speed, and the ability to separate easily in the slot. Isabella just gets open so quickly, something which would work well with Dak Prescott, who often needs those quick windows. You can't play man coverage against this guy in the slot unless you want to get beat, and get beat fast. He would be an excellent piece to add to the Cowboys passing offense. Speaking of playing yourself into better draft positioning, meet Ohio State's Terry McLaurin. 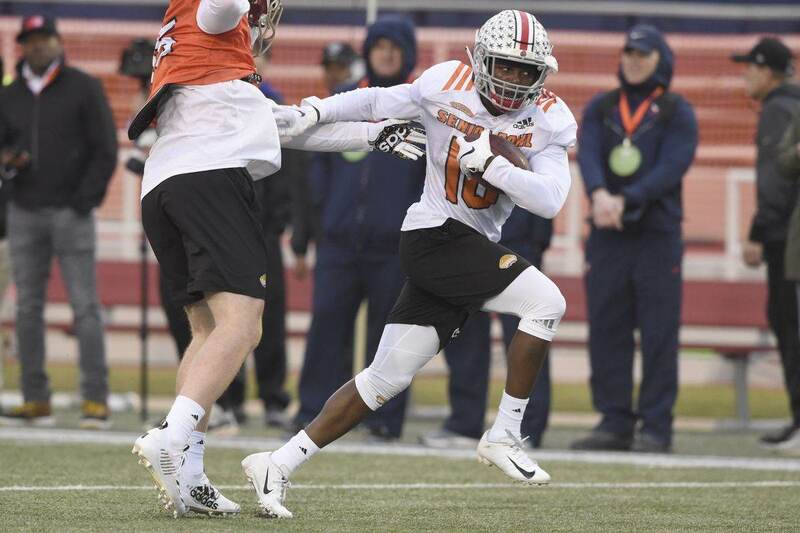 Despite his touchdown drop during the actual game, McLaurin had a near flawless week of practice at the Senior Bowl. Looking like the precise route runner most didn't believe he was, McLaurin made multiple plays throughout that week that grabbed everyone's attention. During the game, McLaurin showed potential in the wide receiver screen game as well as YAC ability. He also can be used on end arounds and jet motion packages, making him an interesting prospect in today's NFL. Don't be surprised if McLaurin is a day two pick this Spring. First team All Conference three times. Conference USA Defensive Player of the Year in 2018. NCAA all time leader in sacks. 67.5 tackles for loss over four collegiate seasons. This guy is a first round pick, right? Both in terms of the expression, and when speaking about the player and his ability. These honors and stats are all held by Louisiana Tech's defensive end Jaylon Ferguson, who played himself into top 50-pick consideration during his college career. Everyone is looking for pass rushers that can get to the quarterback, and Ferguson's college production is second to none. So why is he not talked about as a top tier edge rusher? For starters, people have questions about his level of competition in college. Playing mostly against offensive tackles who will work 9-5 jobs next year, it's sometimes difficult to evaluate just how good small school pass rushers are. This is small concern, however, as Ferguson played well against bigger schools in college as well. The real problem scouts, and I, have with Jaylon Ferguson and the possibility of the Cowboys selecting him 58th overall, are his athletic traits. Ferguson ran an 8.08 second three-cone at his Pro Day. According to Pro Football Reference's combine indexer, only two other defensive ends or edge rushers have ran an 8 second or greater three cone at the combine since 2000. Neither was even drafted. 8.08 seconds is downright horrible, and Ferguson's lack of bend and explosion is shown on his tape as well. Ferguson is a grinder. He's a very powerful rusher who uses his length and strength to his advantage to beat blockers and get to the quarterback. He's not going to show off an incredibly impressive get-off or really turn the corner. But will this work consistently enough in the NFL to take Jaylon Ferguson with your first pick of the entire draft? Personally, I wouldn't consider Jaylon Ferguson at 58. I'd start thinking about taking him in the third round, where the expectations for his future as a rusher will be tempered a bit more. Jaylon Ferguson is too good a football player to flame out of the league or go undrafted, but his traits tell me his ceiling is nowhere near as high as the Cowboys should be looking for with their first draft pick. We've been discussing the Dallas Cowboys' 2019 draft needs throughout the last week, working our way up to the most critical positions. Today we're going to look at defensive end, which could've been a major need if not for some of the Cowboys' recent free agent moves. The biggest move was, of course, getting DeMarcus Lawrence signed to a long-term deal. Dallas avoided a holdout situation with its key defensive lineman, and hopefully soon enough that his shoulder surgery will be fully healed by Week One. Before getting Lawrence's contract done, the Cowboys sent a 2020 sixth-round pick to the Miami Dolphins for veteran Robert Quinn. They've also signed Kerry Hyder, a hopeful reclamation project from the Detroit Lions. These moves were partly necessary as insurance against a stalemate between Lawrence and the team over his contract. But more directly, they were needed after Randy Gregory wound up back in suspended status for another backwards step in the NFL's substance abuse program. The team is hopeful that Gregory will return at some point in 2019, but they're too close to Super Bowl contention to count on it. And with 2017 first-rounder Taco Charlton having yet to emerge as a reliable player, Dallas knew it had to add some different options at defensive end. But with Gregory and Charlton still in the mix, the Cowboys are now about as loaded at DE as they've ever been. In fact, we haven't even mentioned a few other options yet. Last year, Dallas spent a fourth-round pick on pass rusher Dorance Armstrong from Kansas. He didn't get much playing time last year but flashed potential, and he may be in line for more snaps on passing down this year. There's also versatile veteran Tyrone Crawford, who can help one the edges if needed. The Robert Quinn addition means we'll probably see Crawford more at defensive tackle this year, but he's also a factor in the Cowboys' overall security at DE. As we can see, Dallas clearly has a stocked cupboard right now at defensive end. That allows them to not worry about the position in this week's 2019 NFL Draft, but it won't stop them from taking one either. After all, Quinn and Hyder are only here on one-year contract. Crawford is likely going to be released next year to clear cap space. And again, we don't know how much we can rely on Gregory or Charlton now or in the future. The Cowboys would be justified in drafting a DE if a good value pick falls to them somewhere in the middle rounds, particularly if they see that player as having more potential than Armstrong or Hyder. Thankfully, though, Dallas' offseason activity so far has given them draft-day freedom. Their hand won't be forced at any position, and especially at defensive end thanks to their free agent moves. They can afford to wait for exceptional value this year, or until 2020 if needed. They've searched far and wide to get an understanding of this draft class in hopes of finding the best players possible for the 2019 season and beyond. The Dallas Cowboys, however, may find some of their best options right down the road in College Station. During their pre-draft visits, the Dallas Cowboys hosted or met with three players from Texas A&M University. Jace Sternberger, Trayveon Williams, Kinglesy Keke, and Daylon Mack have all been discussed as potential selections during the 2019 NFL Draft, which starts on Thursday. Each of these players fit a position of need for the Dallas Cowboys and each have a different cost attached. Let's talk about each one, where the Cowboys could grab them. and the likelihood of their choice. The Dallas Cowboys have been rumored to need a tight end for the last two drafts. Heading into the 2018 draft, they still had future Hall of Fame inductee Jason Witten on the roster. Then he shocked Cowboys Nation with his seemingly sudden retirement just before the second round of the draft started. The Cowboys didn't panic and stayed true to their pre-draft game plan. They did select a tight end in the fourth round of the draft; Dalton Schultz. As we head into 2019, there is still a large spotlight on the tight end position though Jason Witten again shocked the world and came out of retirement to return to the Dallas Cowboys. Though they would seem set at the position, there is still some uncertainty. Witten is in an advanced NFL age. Blake Jarwin and Dalton Schultz still have a lot to prove. That brings us to Jace Sternberger, who was the focal point for the Aggies passing offense and had a tremendous 2018 season. Last season, Sternberger caught 48 passes for 832 yards and 10 touchdowns. He averaged 17.3 yards per reception. Here's his game log from 2018. You can see that he performed well even against the stalwarts of the SEC. Sternberger's athletic testing wasn't great, but he's an ascending player that could make an impact in the NFL. He's more of a positional blocker, but is willing to get physical and fight in the running game. Sternberger has a good feel for zone and man coverage and shows an excellent ability to make plays down the seem. Many people think he could be gone by the time the Dallas Cowboys go on the clock in the third round at pick number 90, but I think 58 could be a bit early for the Cowboys to take a tight end. Given that there will be defensive lineman, safeties, and wide receivers available to the Cowboys around 58, I'd imagine they wait till later in the draft to take a tight end, if they take one at all. The Dallas Cowboys aren't looking for a lead back. They've got one in two-time NFL Rushing Champion Ezekiel Elliott. What they do need is a reliable backup behind Elliott to take five to 10 touches a game to keep their lead back fresh. Though diminutive in size at 5-9, 200 pounds, Running Back Trayveon Williams is a player that the Dallas Cowboys met with at the NFL Scouting Combine and could have some interest in. Trayveon Williams was a very productive player for the Aggies in his three seasons, scoring 35 total touchdowns in three seasons, including 19 in 2018. In 2018, he totaled 2,038 yards from scrimmage and 6.8 yards per touch. That's incredible production for a player who played in the SEC. Though he didn't have a great showing against Alabama, he ran with the toughness of a player with 20 more pounds on him. This guy is just a good football player. Against Alabama, Clemson, and Mississippi State he struggled, but those squads each feature defensive lineman that will be selected in the first round of the NFL Draft. Alabama's defensive line features three guys that could go by pick 100. Though his athletic testing doesn't show it, he's a player with quickness and enough speed to get to the corner. He did test similarly to former Cowboys Nation draft darling Duke Johnson in the 40, vertical jump, and broad jump. Williams tape looks better than his testing, though it will be his size and his testing that keeps him in the range for the Dallas Cowboys to consider him. I don't believe that the Cowboys will take a running back higher than the fourth round. The runner they select won't have a huge role in the offense because of Ezekiel Elliott. Therefore it makes it difficult to spend a premium pick (rounds 1-3) on a player whose role is limited before even steps foot on the practice field. With the quickness and speed he displayed on tape, Williams could be a nice change of pace back for the Cowboys if they were to select him. The question is, does he fit what the Cowboys are looking for. We won't know until they draft, but if they don't see him as a potential three-down back, Williams may not be the runner that they're looking for in the fourth or fifth round. One of the positions of question surrounds the defensive line and in particular defensive tackle. They've got Maliek Collins, Tyrone Crawford, Kerry Hyder, Antwaun Woods, and Christian Covington all slated to take snaps at defensive tackle. Given that Maliek Collins, Antwaun Woods, and Kerry Hyder will be free after 2019 and they could find cap relief from Tyrone Crawford next offseason, the Cowboys would have a seriously gaping hole at defensive tackle. 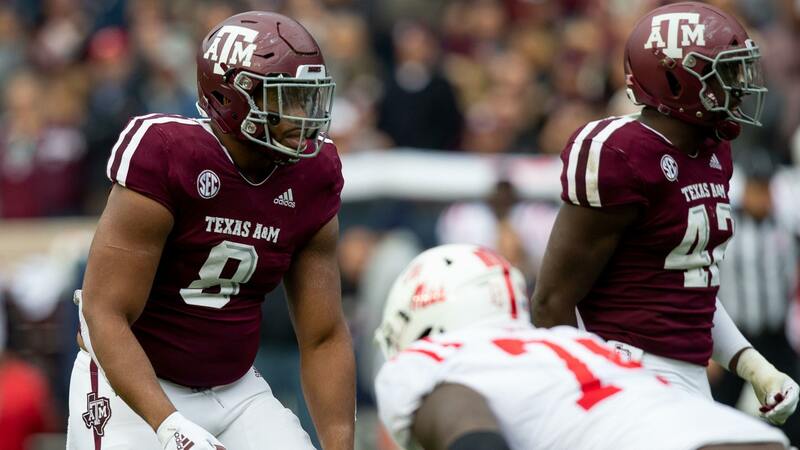 Texas A&M Defensive Tackle Kingsley Keke is a player that could fit into the Cowboys 2019 plans and beyond. Keke has experience playing all over the defensive line for the Aggies and was very productive in 2018. His 7.5 sacks and 11 tackles for loss are evidence of a disruptive player. Though he didn't register a sack against Alabama, he played well during the rest of his SEC schedule. Only one of his sacks and three of his tackles for loss came against non-Power 5 conference opponents. Athletically, he didn't test great, but he tested similarly to Ohio State Defensive Lineman Dre'Mont Jones. Jones has been mentioned as a potential second round pick. Dane Brugler and Jonah Tuls have Keke projected in the fourth or fifth round. Keke is a tall and long player, which fits the defensive line prototype for Defensive Coordinator Rod Marinelli. At 6-4 and 288 pounds, Keke has the size to play the 3-tech position and has experience playing the 1-tech and on the EDGE. This Cowboys coaching staff loves versatility from their defensive linemen. One final player from the Aggies that could hold some interest from the Dallas Cowboys, is 1-technique, Daylon Mack. After seeing the way the Los Angeles Rams abused them up front in the playoffs, the Cowboys could use some beef on the inside. The question is, do they value the 1-technique defensive tackle position enough to spend a draft pick on one? I'm not sure that they do. Antwaun Woods was a pick up off of the Tennessee Titans practice squad. Before him, they used Maliek Collins as the 1-tech in 2017. And before that, they tried Cedric Thornton for a season. The Cowboys front office has had opportunities to address the 1-tech spot along their defensive line, but have shown little interest in doing so. The Cowboys brass met with Mack during the Senior Bowl week and he could have a role with the Cowboys in 2019 if they made him a selection. In 2018, Mack recorded 5.5 sacks and 10 tackles for loss for the Aggies. At 6-1, 336, you could imagine that Mack wouldn't test very well athletically, and he didn't. The only test where Mack scored better than the 25 percentile was in the bench when he recorded 30 reps of 225 pounds. That placed him in the 80th percentile among defensive tackles. Read Kevin Brady's Scouting Report on Daylon Mack. Obvioiusly, it's possible that the Cowboys don't select any players from Texas A&M, but I found it intriguiging that they have shown interest in four of their top players during the draft process. If I had my choice of which they would select, it would be Kinglsey Keke in the fifth round. I think he has a lot of upside as an interior rusher. He wouldn't have to start in year one, but could be a rotational player that would figure into the competition at 3-tech in 2020. There are several schools that have produced really good draft classes this year, but none has garnered more interest from the Dallas Cowboys than the Aggies of Texas A&M.